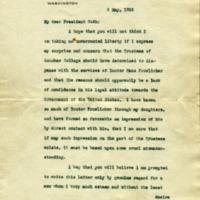 Woodrow Wilson writes to William W. Guth expressing surprise and concern at the dismissal of Doctor Hans Froelicher from employment at Goucher College. I hope that you will not think I am taking an unwarranted liberty if I express my surprise and concern that the Trustees of Goucher College should have determined to dispense with the services of Doctor Hans Froelicher and that the reasons should apparently be a lack of confidence in his loyal attitude towards the Government of the United States. I have known so much of Doctor Froelicher through my daughters, and have formed so favorable an impression of him by direct contact with him, that I am sure that if any such impression on the part of the Trustees exists, it must be based upon some cruel misunderstanding.I beg that you will believe I am prompted to write this letter only by genuine regard for a man whom I very much esteem and without the least desire to thrust my counsel, uninvited, into the deliberations of the authorities of the college. Perhaps my personal interest in the college would be a sufficient justification in the eyes of the Trustees. Wilson, Woodrow, 1856-1924, “Woodrow Wilson to William W. Guth,” 1918 May 6, WWP15065, Goucher College Collection, Woodrow Wilson Presidential Library & Museum, Staunton, Virginia.